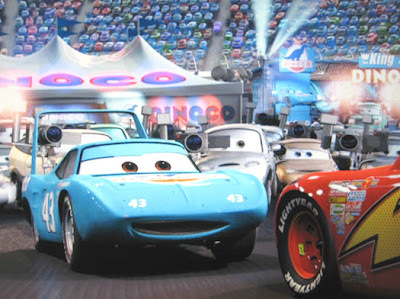 The latest Pixar movie, Cars 2, was released on DVD on Tuesday. Some of you may have seen my essay regarding that franchise that was posted on Design Observer the week of Cars 2’s release in theaters. It stirred up quite a bit of controversy, and I was largely berated in the comments by people who didn’t get the joke, or didn’t like it, or both. And, in probably the oddest bit of fallout, the film critic and writer Roger Ebert, basically ripped off my idea and repurposed it for a piece about the Transformers. Needless to say, it was all interesting and (mostly) fun to watch that unfold. If you didn’t see it before, here it is, republished on my home turf for your enjoyment. Like many people, especially creative types, I’m a big fan of Pixar movies. Their story telling, artful animation, and great voice acting are unrivaled in the realm of animation production. However, they do sometimes take missteps, especially in their design choices. Take for example A Bug’s Life, where the ant characters only have 4 limbs, or the bizarre conceit in Ratatouille that a rat can control a human’s actions by yanking on his hair. It’s perhaps easy to overlook such small things, but in otherwise well thought out environments and scenarios, they are poorly conceived and glaringly so. Without question, their greatest misstep in design, and perhaps in general, is the film Cars. Released in 2006, this film follows the “stranger comes to town” adventures of stock car racing sensation Lightning McQueen. While it was less than loved by critics, there is no question it was a commercial success. In fact, some would say it is Pixar’s most obvious grab at a pay day, appealing to the NASCAR set without even the thinnest of veils. But I would argue its middle-American appeal goes much deeper than its subject matter. Indeed, I believe Cars is a vehicle for the conservative, science-denying belief known as Intelligent Design. Rooted in the Creationist philosophy, Intelligent Design attempts to explain complex scientific phenomenon, especially biological systems such as photosynthesis, or the structure of the human eye, as being the work of a Designer, commonly understood to be the Christian God. In essence, anything that science has failed to yet explain is easily attributable to the work of a higher being whose intelligence, and rationale can never be understood via human empirical thinking. Cars, more than any other Pixar world, is designed and built with that very premise as its foundation. It is a world populated entirely by cars, trucks, aircraft, and RVs. These vehicles are essentially stand-ins for human beings. Their only companions in the animal kingdom seem to be tractors (which are cows), combines (bulls), and little VW Beetles as winged house flies. Other than a pair of steer horns mounted to the front of a Cadillac, and the dinosaur logo of Dinoco Oil, there is no sign of any animal we would recognize... Not a bird in the sky, nor a squirrel in a tree. So one is left to surmise that sentient vehicles simply exist, and always have, independent of any other circle of life. The design of the vehicles is devoid of any suggestion of natural selection. The cars have eyes in their windshield, and mouths, complete with teeth and tongues, between their headlights. (Apparently motorcycles don’t exist, presumably because the Designer couldn’t figure out how to give them a face.) They can flex and move their metal frames, undercarriages, and tires at will, and yet they’re undoubtedly made of metal, plastic and rubber. They are imbued with life, which apparently allows them to ignore the laws of physics. Conveniently, non-living fixtures made of those same materials (buildings, furniture, etc. ), obey those laws. Indeed, it is those very fixtures that offer the most disturbing glimpse into the Designer’s machinations. It’s as if the world was made by humans, now long gone, and replaced by living, breathing autos. One might expect Charlton Heston to crash land on the planet and later discover that those maniacs blew it up. On this Planet of the Cars, buildings not much different than ours awkwardly accommodate their four-wheeled tenants; gas pumps—again, like ours—operate with precision simply by pressing a button the ground; and farms, growing vegetables for goodness know who, line the highways. Even the cars themselves are at the whim of a seemingly human mind. They have doors and windows that never open. They’re alive and moving, but can only drive with gas in their tanks. Boy cars and girl cars are attracted to each other, raising awkward questions about reproduction (and yet, no kid cars?). Photojournalist cars are forced to use large, clumsy, tired-mounted rigs to hold cameras, and the racing pit crew chiefs wear comically huge earphones on their non-ears. Perhaps the greatest injustice seen is a minivan toting a mattress atop its roof down the interstate. Do I need to mention they don’t sleep in beds? But there are a couple of crucial elements in the design of this world that point not to a human overlord, but an all-powerful Designer with a bad case of motorhead. 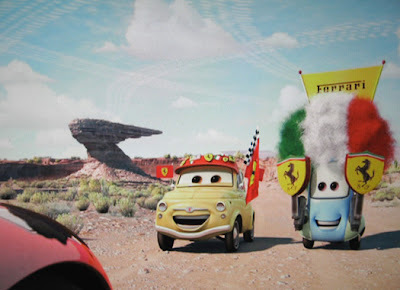 The rock formations surrounding the movie’s main location, the town of Radiator Springs, resemble similar landmarks of our American Southwest, particularly Monument Valley, with one major difference: They are in the shapes of cars and car parts. That would be as if our Mount Rushmore was a naturally occurring phenomenon. But even more inexplicable than the Geo-logy: if one looks closely enough, cloud formations resembling tire tracks can be seen drifting through the sky. Certainly, it’s no mistake that this most befuddling design element is also the most heavenward. There’s something up there, and It won’t be explained. But It does have a name, and we can thank the tractor trailer character Mack for this revelation. Upon finding his lost friend McQueen late in the second act, he exclaims, “Thank the Manufacturer!” Must we? This weekend Cars 2 opens. It will be the first Pixar movie I make a point of not seeing. It’s not that I even mind so much that it’s propaganda, or even that it’s propaganda for “The Manufacturer.” In theory, I could forgive that. What I can’t forgive is that director John Lasseter and his team hung their hat on Intelligent Design, and alas, it’s anything but.